Here’s something obvious: money is one of the biggest barriers to study abroad. Half the battle of going abroad is coming up with the money for program fees, housing, flights, and living costs. Additionally, there are travel and leisure costs which are essential to an international experience – what’s the point of going abroad if you’re going to stay home and watch Netflix all day? For many, it’s considerably more than just a barrier to entry. It’s a deterrent. 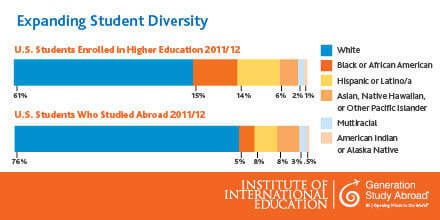 The assumption is that a majority of students would love to study abroad at some point in their college careers. But, instead of being seen as an academic and professional boost, it can be perceived as a luxury, something to be indulged by the privilege. The good news? The international education industry is working hard to find ways to help combat the obstacle that is funding. The solution to a student’s lack of funds? Simple. Provide funding! While that’s certainly easier said than done, there is no shortage of organizations that are offering scholarship opportunities to students interested in going abroad, from government-funded initiatives and nonprofits to universities and for-profits. One such opportunity is the Benjamin A. Gilman International Scholarship Program, sponsored by the U.S. Department of State Bureau of Education & Cultural Affairs, and administered by the Institute of International Education (IIE). The program will award over 2,800 scholarships, available to U.S. undergraduates this year. Depending on factors such as length of study and student need, the scholarship awards vary. Additionally, Gilman Scholarship recipients receive access to State Department and IIE resources, including a significantly large network of alumni to further support international experiences and job opportunities. We had the pleasure of speaking with the Director and Assistant Director of the Gilman Scholarship Program, Lindsay Calvert and Shawna Hurley, respectively. Note: The Gilman Scholarship Program encourages students to apply to study or intern abroad in “non-traditional” locations. However, that doesn’t mean students who are thinking of studying or interning in a “traditional” study abroad destination should be discouraged. Applicants must identify why their program and location of choice will make an impact on them, articulate their academic and professional goals for their experience, and address why participation and achievement of identified goals cannot take place in another country. While the Gilman Scholarship Program looks to increase diversity in the study and intern abroad space, another organization, the Foundation for Global Scholars, is on a mission to cultivate young leaders, stressing a focus on helping them gain leadership skills and cultural competence through these overseas experiences. “The FGS scholarship program has been reimagined. In 2016, the new GRIT (Globally Remarkable International Talent) program will be introduced. This program will both prepare students for study abroad and financially support the international experience,” explained Jodi Reesman, Scholarship Director of the Foundation for Global Scholars. Currently, they offer a Study & Intern Abroad Scholarship while they’ve run other opportunities within the study abroad sphere, such as the recent Study Abroad in New Zealand scholarship, as well. The one universal tip for students in regards to scholarships is to make sure to apply. The truth is, there are a wealth of scholarships out there. The hard work is sifting through all the scholarships to find the ones relevant to you. Is that effort not worth it if that means the possibility of receiving money for your dream experience? A good place to start your search is on sites like the IIEPassport Study Abroad Funding page and InternationalScholarships.com (these resources were suggested by Calvert and Morris, respectively). Scholarship programs not only benefit the individual award winners, they also play a huge role in changing the landscape of international education through the power of networks. The effects of an individual going through a scholarship program is immeasurable. Nowadays, inspiration is derived from a variety of sources. A student who’s unaware of abroad opportunities like international internship might discover them on social media or a peer who just returned from a summer abroad. One of the main catalysts for increasing awareness for abroad programs is the internet. Given the content-thirsty world we live in, students are able to share their stories to an audience that clamoring to hear from them. Sites like Go Overseas are built with a basis in peer-reviews. They have harnessed the power of the internet to make information about the vast pool of programs in the world accessible to anyone who seeks it. Go Overseas is making programs more transparent, creating “ambassadors for a more understanding global community,” and inspiring prospective study abroad students to take that first step towards embarking on their next adventure. “We’d like to think that our Go Overseas Community is a rewarding group to be involved in!” said Morris. To go even further, the Foundation for Global Scholars is hoping to change more than the international education industry. They are hoping to change the world. They believe that study abroad isn’t just beneficial to the individual. Ultimately, a great program can nurture the future leaders of the world. “Our changemaker awards are but one example of this. 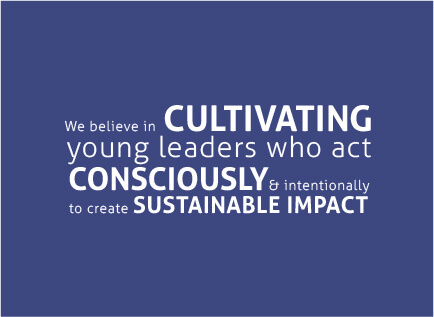 FGS creates a community of intentional and conscious global changemakers. We invest in impact; we invest in our future leaders,” Reesman added. The bad news is there are many other barriers to studying abroad. “General awareness of their options or alternatively information overload,” offered Morris. “Program (major) requirements, which seem to be especially institution-specific or proprietary, create either a real or otherwise perceived-real-but-false barrier to studying off campus, most especially as pressures to not prolong the undergraduate experience increase,” said Reesman. “Often, there are other obstacles for students with financial need. For example, they might have work or family obligations. An experience abroad could disrupt those obligations,” Calvert replied. International educators need to show students that an experience abroad is more than just a luxury. “We hope that students can realize that studying abroad is not something extra, but it’s something that can be critical for improving their long-term career prospects,” said Calvert. “Interestingly, however, recent studies suggest that study abroad increases the probability of a four-year graduation, as discussed in the Inside Higher Ed article ‘Study Abroad, Graduate on Time’ by Elizabeth Redden.” added Reesman. The good news is there are conscious, coordinated efforts to increase the profile of study abroad. 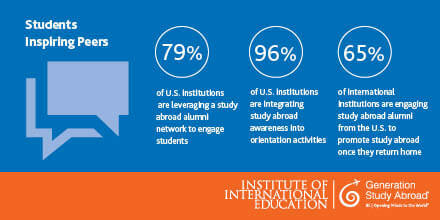 For example, the Generation Study Abroad campaign (an initiative of the IIE) is doing just that. They hope to double the number of students studying abroad by the end of the decade. With every year that passes, more and more universities and institutions are making it a priority to improve their offerings in the space. Given the current fervor to promote study abroad, international experiences might truly become an integral part of society’s educational framework.